Having trouble comprehending the two types of Internal Rubber Mixers? Well, it’s not as difficult as you think. 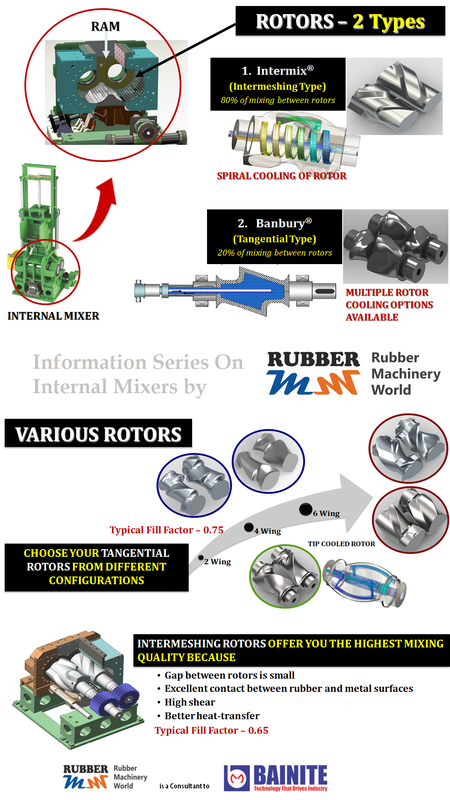 Here’s an info sheet that gives you all the critical aspects that you need to differentiate between Intermeshing Type Mixer and Tangential Type Mixer. The Rotors, Configurations, Fill Factor, Position inside the Mixing Chamber, Mixing Nature, Rotor Cooling and Mix Quality all explained in a single page for your ready reference. A Quick Reference Chart on Internal Mixer from Rubber Machinery World. I hope you will have this handy when you plan discussions for a new or used internal mixer or while addressing purchase selection questionnaire. Let me know if you found it informative. Categories: Compounding Machinery, Mixing Machinery, Non-Tire Rubber Industry, Tire Industry | Tags: Fill Factor, Intermeshing Type Mixer, Internal Mixer, mixing chamber, Rotors, Rubber Mixer, Tangential Type Mixer | Permalink.